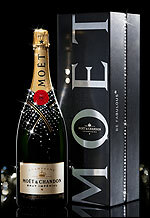 Moet & Chandon is the world's leading champagne brand. With the region's extensive vineyards and several centuries of expertise, the Moet name guarantees consistent quality across the range. Enjoyed by aristocracy and celebrities alike, the brand embodies on overwhelming sense of style. 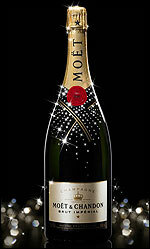 It is unsurprising therefore, that Moet & Chandon, the ultimate Champagne, is consequently on everyone's lip. 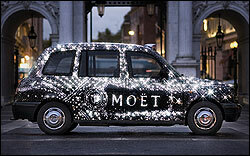 MoEt Sparkles Up for any OCCAssion … and shows off its brand new clothes! Moët & Chandon introduces the latest limited edition crystallised collection, created exclusively with Swarovski. We are also unveiling our brand new clothes! Our first re-design of the label for over 150 years! Available for the first time in both a full-on-fabulous jeroboam and in our perfectly formed Mini Moët, we are covering this celebratory champagne with beautiful crystals. The ‘Moët Swarovski Collection’ has been created to add a bit of sparkling glamour to any special occasion and should be shared in a romantic tête à tête, enjoyed with friends and family, or purely as an eye-catching addition to the festive season. 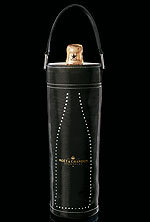 The technology used to create this bottle is unique and was co-created by Moët & Chandon and Swarovski. ‘Crystal-it’ technology has been produced to withstand contact with water. 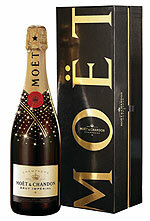 MoEt Gold Coffret containing 1 Bottle 75cl of Moet ET Chandon Brut Imperial including Gold Swarovski Crystals! Swarovski in Partnership with Moet et Chandon have been very popular abd we are very pleased, that we still are able to provide stock. We have just included for Partis and Special Occasions 2 larger sizes incl Wooden Boxes printed with the Moet and 'Be Fabiolus' Logo. 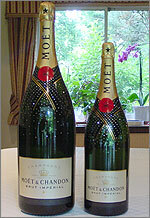 Do you know the names of all the different sizes of Champagne Bottles? Gift Boxes from other Champagne Houses are available.